This is a little video tutorial (scroll down for video) on how to give access to your Facebook ads manager. When you run an ad, it is paid via your own personal Facebook. So depending upon which side of the equation you are on – doing your own ads, having a social media manager run them for you or you are the social media manager running the ads… this may be helpful for you. 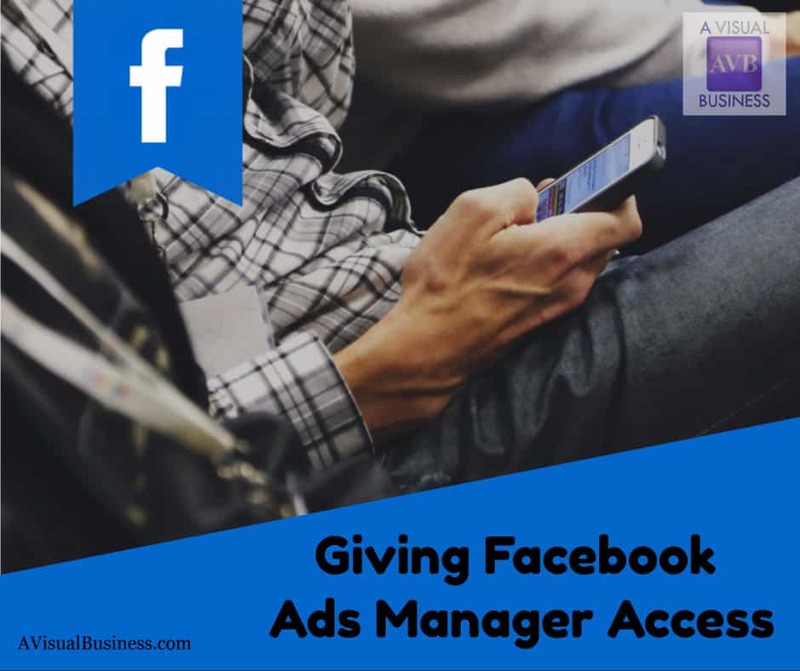 First I cover how to set up your Facebook Ads Manager with your credit card and billing information, then share with you how to access your FB Ads Manager to give someone else access or how to tell someone else how and why to give you (the social media manager) access. Why is this important and for whom? As the credit card owner, you may not want to provide that to your social media manager. Similarly, you may want to see how your dollars are being spent and that, in fact, they are being spent. Hopefully you have some sort of contract with the person running the ads, know what is included and then have built that great relationship so you don’t have to micromanage, but it’s nice to know. Plus, it’s 100% transparency and I think further solidifies your value. You have nothing to hide and it helps this industry where there is so much deceit! If you are the social media manager, you can bill the client for your FB ads management and the cost of the ads, but now you are covering that up front and maybe paying credit card fees (yours) as well as other fees (like Paypal, etc). What if they bail or go out of business, now you are stuck with a loss in the ad dollars you already spent for them AND your time. BOO!! So, you may want to have the advertising budget running through the business owner and their credit card, which means you would need access. Further, this allows you the flexibility of changing the budget month to month without having to change the billing every month for however much the advertising budget is for. As I noted above, I would rather have 100% transparency and security and knowing that they are paying for the ads versus me paying for their ads and the time; and not having to wait for them to pay me back for the ads which I’d have to add to my taxes as a deduction as an expense. So this video is going to explain how you would set up your Facebook Ads Manager and then admin access to somebody else. If you are a social media manager this would be something that you could forward to your clients to show them how to give you the access and why. As an aside, this is the Facebook Help section sharing how to do these steps and this is the Facebook Help permission levels. Should you have any questions about Facebook Ads Manager or need help with your Facebook social media ads, please contact me as I would be happy to run them for you. Similarly, if you are looking for some help on how to run your Facebook business page on your own, I have created a video, similar to this one for all of the steps on how to be successful with your Facebook Business Page, DIY Style. Or, contact me for a social media review on how you can clean yours up! Seeing this process in the video is really helpful! I realize that setting up the system is so important to successful sales. The services you provide businesses are amazing Kristin. This is helpful to see the set up Kristen and the reasons to do eliminate any initial feelings that may cause unnecessary angst and concern. Seeing the steps makes it so clear and easy to follow, Kristen and you have good points for why you should do it this way. Your advice is always so helpful. I have the link to the video you made regarding giving admin access to your site on my desktop to refer to easily. I am so glad Tami… that one is even more useful! Loved seeing the steps! Eventually, I will do some Ad outsourcing, so good to know how to do without affecting my credit card. Loved the video; made it so easy to grasp. Videos for stuff like this are so much easier for folks to understand Robin. You should definitely be doing ads for your stuff! Love the video! You already know that Facebook drives me bonkers, so it’s great that you’re helping people figure it out. I’ve run ads for my clients and had to absorb the cost then bill them. I don’t like it! This is so much better for everyone involved. As usual, valuable information. Your are NOT alone on the driving bonkers part… for sure Meghan! I have absorbed the cost then billed for my first few and when the budgets are small that isn’t as big of a deal but now I have a few that are over a hundred and a few hundred and I’d prefer not to front that. Plus, as the budget changes, so does my admin, so this way, it’s easier to change just my admin billing and then know how much was spent on ads – which is flexible! It helped a lot for the facebook ads. I know if I need help with this I will be hiring you. The article is packed with great tools, but most people are visual as I am. Thank You! Excellent Kristen! This tutorial is so helpful especially for those who wish to give access to their Fb Ads accounts. It is amazing how easy it looks yet many of us are unaware. Thanks for this illustration. Thank you for this Apolline. I know you must deal with all the time too. Great way to do a video to show how it all works. Did not know about this option here…cool. Now you do! Awesome and thanks Katarina! With all the new and changing options out there, it’s a blessing Kristen that you take the time to explain it to us in such detail. I always seem to learn better when it’s a step-by-step video process. I haven’t gotten to the point of doing Facebook adverts but you’ll be first on my list when I’m ready.